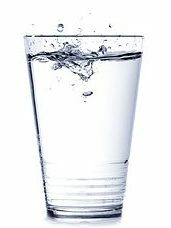 Drinking plenty (1.5-2L per day) of pure unadulterated water is the simplest and best step you can take to improving your health. I’ve been researching the best drinking water for more than a year and I’ve finally taken the plunge (groan!) and bought myself a Big Berkey filter. The water tastes delicious, it’s had up 99.9% of contaminants removed by the huge charcoal filters and its pH is more alkali – win/win/win. I’m very pleased with it and so I’m happy to recommend them. Read the Big Berkey lab results for more information about what is removed. Update February 2019: this independent lab report confirms that Big Berkeys remove 100% of glyphosate (Round-Up). Excellent news! One of my concerns about charcoal filtering was that the beneficial minerals such as zinc, selenium, etc are also removed. So, I’ve added some Yve-Bio raw mineral and gem stones to the bottom of my Berkey (and my water jug – you may have spotted them at a recent appointment – and my water bottle). If you currently use a plastic bottle (or even worse you refill mineral water bottles with tap water), you should consider investing in one that’s stainless steel (or glass but that’s not really practical). That way you know that there are no plastic chemical contaminants coming from the bottle. I use this insulated 750ml bottle. < Previous Homocysteine: is it just about THE BEST indicator of health?